The guitar's history mirrors the cultural values, preoccupations, and norms in the United States over time. So, too, does the guitar's design, especially since the development of solid-body guitar construction by the 1950s. Because the sound produced by solid-body electrics does not depend on their shape, makers could experiment with a wider range of guitar designs. This era's seemingly radical instruments echoed the popular cultural focus on space-age modernity. The Fender "Strat" recalled the modern tail fins and imaginative colors of Detroit's cars, while the Gibson Flying V literally appeared ready for takeoff. Once the electric guitar had been firmly established by the 1960s and 1970s, guitar designs became increasingly distinctive and reflective of popular music trends. And by the 1980s guitarists were more and more concerned with the look as well as sound of their instruments, regarding their guitars as identifying signatures. Eddie Van Halen decorated his guitar with colored sticky tape, and Prince has had guitars of all shapes and colors custom-created for his stage performances. Today, makers of electric guitars often emphasize materials, finishes, and overall design as much as the technological aspects of their instruments. Style and craftsmanship are and will continue to be especially important to the marketing success of electric guitars. I first met Ralph Novak in 1980, when he was working at Subway Guitars in Berkeley, California. I'd assembled a kit Strat and it needed a refret. My monstrosity was painted Shell Pink in tribute to Strats from Fender's surf era. Little did I know what was to come of Ralph's distant future. He was the fret guru in Berkeley, and his work was astounding - the best I'd ever seen! Ironically, Vintage Guitar columnist Stephen White was also working at Subway at the time. So began our journey into luthiery madness! Fast forward to 1989. In the years since, Novak has built the instruments of choice for the likes of musicians like Charlie Hunter, Phillip De Gruy, Joe Louis Walker, and Henry Kaiser, to name a few. As time passed, he experimented with a variety of design ideas involving the use of non-traditional woods. At times, he was viewed as downright crazy from many a purist's standpoint. But he turned the other cheek, seeking the solutions that would satisfy his own personal playing requirements. As a guitarist with a complete understanding of the vintage instruments he worked on, Novak wasn't completely comfortable with what any one instrument was capable of delivering. He wanted to combine all the features of his old favorites while adding design twists that would give him everything he was looking for in an electric guitar. This led to the invention of his patented fanned-fret fingerboard, which gives an instrument combined scale lengths. Electric guitars have traditionally had two big measuring sticks in the Fender Stratocaster and the Gibson Les Paul. These are two traditional designs that have stood the test of time and won the respect of guitarists from many genres and generations. Welcome to FenderWorld Where music, musicians, great instruments, audio gear and accessories come together online. In many ways the Fender Stratocaster is the antithesis of the Gibson Les Paul style guitar. The first thing I notice when I sit down to play a Strat style guitar is the fantastic body shape - it's just a perfect fit. The Strat typically has a scale length of 251/2 inches which is considerably more spaced out than the Gibson. While a Gibson has the warm humbucker tone, a vintage Strat tone is thin and sharp, almost cutting. To achieve this there are three single coil pick-ups with staggered coils which equalise the prominence of all the strings. The humbuckers Gibson use are basically two single coils wired parallel to cancel some of the background hum that the Strats suffer from. In doing this however they loose some of the higher frequencies which give the Strat their sharp, jangling tone. The massive Fender scratch plates were originally used to protect their pick-ups from picking up too much background buzz and they've become one of the Stratocaster's most distinctive features. The Strat also has the tremolo bar which the Gibsons lack. For the uninitiated the name 'tremolo' is a bit of a misnomer as the 'whammy' bar actually allows you to pitch bend by tilting the bridge back and stretching the strings while the 'tremolo' effect usually refers to changes in volume. In 1997, Fender broke ground in Corona California to build the largest guitar and amp factory in history. The plant is estimated to be 160,000 square feet. In August 1998 the world will see one of the most sophisticated and state-of-the-art manufacturing plants ever built in the guitar industry! See a quick extract of Guitar FAQ! Epiphone ES 339 - a smaller ES series guitar, a double cutaway, semi-hollowbody thinline. Epiphone Ultra 339 - a classic semi-hollow look packed with modern features. Epiphone Limited Edition ES 355 - this is the basic model B.B. King's "Lucile" was based on. Epiphone Limited Edition ES 345 - an affordable, yet quite respectable, version of the ever popular ES-345. Epiphone Ace Frehley Budokan Les Paul Custom - a recreation of the Les Paul Ace Frehley played at the record breaking Budokan KISS concert series. Ibanez are one of the best known of the more contemporary style guitars with artists such as Satriani and Vai on their books. This particular model, the RG 450 Deluxe, boasts a layout which traditional Fender players will be familiar with, but it's a very different guitar. It is a more compact instrument than the Stratocaster and with two humbuckers separated by a single coil, the pick-up system allows you to create some thick tones. In fact if you play around with the five way selector you can get just about any tone you could want. The body shape is very sharp and clinical and with jagged bolt inlays and the traditional Ibanez pointed headstock the guitar is very recognisably Ibanez. It also features a quality tremolo unit and two full octaves on the fingerboard with wide cutaways for access. This is an excellent alternative to the Gibson or Fender style dichotomy that dominates the market. If you're searching for your own sound, somewhere between the two, it's worth checking out the Ibanez range. Ibanez - Monstrous Metal Guitars? See Steve Vai & Joe Satriani! In the early 1960s Rickenbacker history became forever wedded to one of the biggest music upheavals of the 20th century: the invasion of the mop-top Beatles from Liverpool, England. The Beatles used several Rickenbacker models in the early years. Before the group broke up, John Lennon would own at least four. This love affair began in Hamburg, Germany in 1960 when he bought a natural-blonde Model 325 with a Kauffman vibrato. Lennon played the original (which was eventually refinished black but still easily identified by its gold-backed lucite pickguard) on all Beatle recordings and in all concerts until early 1964. The Vox Show Room shows the classic amps behind the British Explosion of sound in the 60's. VOX, at one time was one of the largest musical instrument producers in the world and their products were utilized by almost every major music group during the nineteen sixties. From The Shadows to The Beatles to U2, VOX is the "voice" of generations of musicians worldwide. Augustino Lo Prinzi Guitars - Augustine Lo Prinzi has made more than 10,000 guitars and just started his 49th year as a guitar maker! Renowned throughout the instrument making field, Augustino LoPrinzi's first instruments were classic guitars. As his career progressed he constructed many types of string instruments, numbering in the thousands : mandolins, lutes, violins, and steel string guitars, to list but a few. Now he is applying these years of wisdom to his first love, the classic guitar, which began his journey into instrument making. Chabot Guitars - Paul Chabot used to offer quality hand made Classical guitars (Colorado, USA) "Paul first apprenticed und er guitar maker / repairman Robert Buchanan, where he became familiar with the aspects of guitar repair, and guitar refinishing. Furthering his ability and knowledge, Paul attended Roberto-Venn School of Luthiery where he learned the basics of wood, instrument design and guitar making. Not long after graduating from Roberto-Venn, Paul was fortunate enough to apprentice under world renowned Master guitar maker Augustino Lo Prinzi. Through Augustino Lo Prinzi, Paul was able to learn some of the most proven methods and advanced techni ques of fine guitar making." C.F. Martin & Co. - Martin is one of the oldest acoustic guitar manufacturers in the world, and it continues to be a family owned business. It was founded by C F Martin in 1883, and was the pioneer designer of the popular dreadnought shape. Up to now, Martin produces the most sought after acoustic guitars in the market. Maton Guitars - Australia's leading manufacturer of Acoustic and Acoustic / Electric Guitars. Until the late 1930's the Australian guitar manufacturing industry was virtually non existent and good quality guitars were hard to find. The best guitars, it was well understood, came from the U.S.A. Bill May, a Melbourne born jazz musician, woodwork teacher, and luthier, decided to change all that. Manne guitars - This Italy based guitar manufacturer produces instruments with unique features. The first Manne guitar was built in 1986 and they continue to provide finely crafted instruments based on some very original design concepts. Manne's design philosophy: hand craft the finest stringed instruments then offer them to the public at a reasonable price. Epiphone - Before being bought out by Gibson in the late 1950s, Epiphone was actually Gibson's main rival in the archtop market. Now they are known for producing more affordable alternatives to Gibson branded models like the Les Paul, SG etc. RainSong - If you are looking for environmentally friendly guitars, then feast your eyes on the various all-graphite (carbon fiber) instruments from this US based manufacturer. Peavey - Hartley Peavey started Peavey electronics in 1965, it went on to one of the largest musical instrument and audio equipment manufacturer in the world. They offer a multitude of guitars, amps and related gear, and the price point they use are comparatively very reasonable. One of their latest guitars, the Peavey AT-200, has the guitar world talking about its innovative auto-tune feature. Washburn - With a long history that dates back to 1883, Washburn makes various types of guitar related products including electric, acoustic, bass, amps, banjos, mandolins and amplifiers. Their old acoustic guitars were involved with Delta blues back in the 1920s, while now, they are recognized mostly for their metal/rock friendly electric guitars. Lakewood Guitars - These are German made high-end acoustic guitars that are expensive. They offer beautifully manufactured instruments in a range of body sizes. Try out their cool online guitar designer that will let you build your guitar online and it shows you a 3D view of how your guitar would look like. G & L Guitars - Leo Fender founded this US Based guitar company with then-partner George Fullerton (hence the name G & L. They offer guitars similar to classic Fenders, but with some modern innovations. It is said that if Leo Fender stayed with Fender, their instruments will be upgraded to the G&L designs, which he considers as an upgrade to his classic guitar creations. Cort Guitars - Cort is known for their reasonably priced instruments and gear. They have a wide range of instruments available worldwide from rocking-out solids to traditional acoustics. Paul Reed Smith - PRS guitars are relatively new, but it is more than capable to challenge more established brands, and has continued to climb in popularity. They offer a full range of instruments that follow their distinct shape, which combines Gibson's aesthetics with Fender's versatility and playabiltiy. Carvin - Like Peavey, Carvin spreads itself for the various niches of the audio market, building guitars, basses, amplifiers and pro audio gear, and they have been in this business for more than 60 years. The quality of their custom-made bass and guitars is well received by many. Takamine - This Japanese guitar manufacturer is known for their acoustic-electric instruments. They are one of the first few companies that implemented acoustic-electric models, and played a pioneering role in the design of the preamp-equalizer component, which are now common place. Godin Guitars - Robert Godin heads this Canadian based guitar manufacturer that offer acoustic and electric guitars. Their ability to produce instruments that offer innovation and quality while retaining affordability, helped propel them to their brand's worldwide reach. ESP Guitars - The ESP brand has risen to popularity especially in the rock and metal arena, thanks to endorsements from Metallica and other artists such as George Lynch and Kerry King. They also offer guitars in more traditional forms and configurations, but with their own distinct twist. Fury Guitars - Founded in 1962, this manufacturer is considered as one of the first ones to produce electric guitars in Canada. They continue to build unique looking electric guitars that include standard 6-strings, 12-string, baritone and bass with drop D.
Brian Moore - Known for their innovative custom electronics and distinctive designs, Brian Moore Guitars continue to produce guitars that go beyond the conventional. Aside from their custom-built instruments, they now carry a host of artist signature models. One of their more popular products is the iGuitar, which feature acoustic MIDI, piezo, 13 pin Synth and more. Allen Guitars - Every Allen instrument is individually hand-crafted. Nothing is mass-produced. The hand carving of the braces, the painstaking and careful construction process result in a signature sound that many continue to approve. Allen Guitars also upply exotic tonewoods, abalone shell inlay, ebony fretboards and other luthier needs. Snarling Dogs - If you saw a wah pedal that has a foot-shaped footpad, then you are looking at a Snarling Dogs' designed wah. They also offer various types of guitar and bass strings. Their products are now available from D'Andrea. MDX Custom Guitars - The man behind this custom guitar workshop is Dwight Maddox. They've been building unique guitars that follow exactly what their customer want, from shape to hardware to electronics. National Reso-Phonic Guitars - World renowned for their resonator instruments. Unlike acoustic guitars, where the vibration of the wooden body creates the sound, in a resonator instrument the body acts as a speaker cabinet. When the strings are plucked, the vibration is transmitted through the saddle to the resonator. The resonator, or speaker cone, then amplifies that vibration. Vox Amps - Vox is one of the largest musical instrument producers in the world and their products were utilized by almost every major music group during the nineteen sixties. From The Beatles to Lawrence Welk, VOX was the "voice" of a generation of musicians worldwide. Now they continue to produce their distinctive amps and effects, embracing modeling technology while retaining tube amp products, and at times combining them. They also produce instruments and other guitar/bass related gear. Ampeg - Ampeg is a guitar and bass amplifier manufacturer that was known for their loud and powerful bass amps. They are now under the Mackie brand and continues to produce sought after amplifiers and cabinets for bassists. Matchless - Matchless was founded in 1989 with the aim of creating versatile amplifiers for guitar players. Their class A tube circuitry is sought after along with the workmanship quality exhibited by their products. Marshall - This British company is one of the most recognized brands in amplification, thanks to the many artists that made the "Wall of Marshalls" a staple of their performances. The Marshall "crunch" tone has made its way to many iconic recordings, and continues to be a standard by which overdrive/distortion effects are measured with. Seymour Duncan - Pickups designed by Seymour Duncan first appeared in Floyd Rose equipped Kramer Guitars at the height rock, new wave and shred era. Now they produce all sorts of pickups that cover a variety of electric guitar and bass guitar models, both in single coil and humbucking format. Guild Guitars - Guild is a well known acoustic guitar manufacturer. The brand was acquired by Fender in 1995, and has continued producing archtops and acoustics. Guild recently released a new Doyle Dykes signature model. Conde Hermanos-Eseso - Established in 1915, this flamenco and classical guitar manufacturer has a nearly 100 year old guitar making tradition. They now offer various classical and flamenco models, including ones with modern cutaway features. They also create custom guitars for their customers. Wechter Guitars - Abe Wechter has been designing and building guitars for 22 years. It has been a long journey from his first guitar shop in Seattle, Washington, to his current shop in rural Van Buren county Michigan. Daedalus Music - This New York based workshop produces cabinets and speaker systems for musicians. They sell and manufacture acoustic guitar amps and cabinets using handcrafted renewable North American Hardwoods. The name Daedalus is based on a skillful artist and inventor as found in Greek legends. Breedlove Guitars - This Oregon-based guitar manufacturer produces beautifully hand-crafted acoustics. Their site offers in-depth information on products and prices, as well as offering company and acoustic music information and news. Fuzzy Pedal Steel Guitar Products - This tokyo based workshop is headed by Mitsuo Fujii, and it is the brand behind the Excel series of pedal steel guitars. They also offer Jerry Byrd signature instruments. Guild of American Luthiers - Aside from publishing the world's foremost lutherie magazine - American Lutherie, this site offers a lot of useful information for custom guitar makers and prospective buyers. 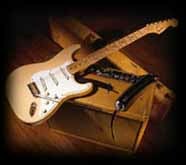 The Ultimate Guitar Repair Shop - Gene Liberty has been working in the Northern Illinois area with over 25 years of full time guitar repair and custom building experience. Also specializing in the design and custom building of tools, fixtures and machines specific to guitar repair and guitar building. Larry Robinson Fine Custom Inlays - They produce one-of a kind shell inlays for all kinds of guitars. One of a handful of inlay practicioners in the country, Larry has done exquisite work for major guitar manufacturers (Fender, gi bson, Yamaha,...), small production shops (Santa Cruz, Collings, etc. ), single luthier shops (Klein, Ryan, Olson, Megas, and more), collectors like Tsumura and people who just want something to personalize their guitar. Wait - There's much more! See which manufacturers made the Top 5 Electric Guitar Brands list.